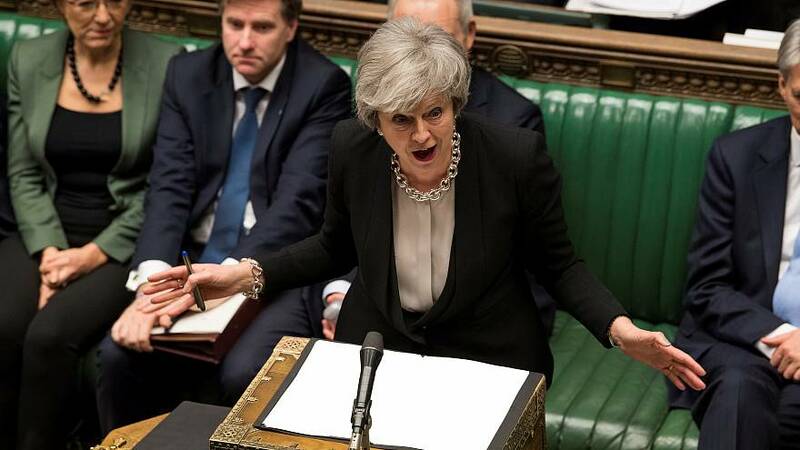 British Prime Minister Theresa May is hoping parliament will show her some love on Valentine's Day by backing a motion reiterating its support for her Brexit strategy and rejecting amendments that would force her hand. Lawmakers in the UK will vote on May's latest motion on Thursday and could be asked to vote on five other amendments brought forward by MPs. These plan to either force May to call a new meaningful vote on her Brexit deal before the end of the month, delay Article 50 or even scrap it altogether. House Speaker John Bercow will decide which amendments will make it to the floor for a vote. Here's your guide to the different Brexit votes that could take place on Thursday. The prime minister's motion calls on parliament to "reiterate its support for the approach to leaving the EU (European Union) expressed by this House on 29 January 2019 and notes that discussions between the UK and the EU on the Northern Ireland backstop are ongoing." What this means in effect is that MPs are being asked to once again endorse two amendments that were previously successfully adopted. The first one, by Sir Graham Brady, called for the backstop — the mechanism that would see Northern Ireland remain within the EU's customs union should another solution not be found before the end of a planned transition period — to be replaced. The second one, tabled by Dame Caroline Spelman, states opposition to leave the bloc without a deal. This is not going down particularly well with Brexiteers in May's own Conservative party. Mark Francois, the vice-chair of the eurosceptic European Research Group, which comprises as many as 80 MPs, told the BBC on Wednesday: "We cannot vote for this as it is currently configured because it rules out no deal and removes our negotiating leverage in Brussels." "The prime minister, if she went through the lobbies for this tomorrow night, would be voting against the guarantees she has given in the Commons for a month. It is madness," he added. The main opposition party led by Jeremy Corbyn has also tabled an amendment. If adopted, it would force May to table a new meaningful vote on her Brexit deal by February 27 or admit that "there is no longer an agreement in principle in the negotiations" with the EU. If the latter, then the amendment would force the government to table another amendable motion on "how the government proposes to proceed." Corbyn said the amendment "would stop the government from running down the clock on the Brexit negotiations, hoping members of parliament can be blackmailed into supporting a botched deal." The prime minister has already announced that if there is no deal by February 26, the government will hold a debate on an amendable motion the following day. Conservative MP Kenneth Clarke is calling for MPs to be able to rank Brexit strategies by order of preferences. His amendment plans for MPs to be given a ballot paper with a list of options brought forward by their peers, provided they are backed by at least 50 MPs. Clarke's motion is being co-sponsored by Labour MP Harriet Harman. Labour MP Roger Godsiff has also tabled his own amendment which would calls for an extension on Article 50 — which would delay Brexit — in order to hold a second referendum. Voters would be presented with three choices: accept the final agreement between the UK and the EU approved by parliament; reject the agreement and leave without a deal; or reject the agreement and revoke Article 50 altogether, thus staying the EU. With its amendment, the Scottish National Party wants to stop Brexit altogether by revoking Article 50 before March 29, the date the UK is scheduled to leave the EU. Tabled by Labour's Chuka Umunna and the Conservative Anna Soubry — both Remainers — this amendment would force the government to make public the most recent Cabinet briefing on the impact a no-deal Brexit would have on trade and business. If approved by lawmakers, the government would have seven days to release the briefing.